The Just Tattoo Removal Vision is built on the belief that our company and its associates can improve people's lives by erasing their unwanted Tattoos; helping them look and feel better and thus enhancing their overall well being through the technology of non-surgical Tattoo removal. The Tattoo industry is positively on fire! There are an estimated 15,000 Tattoo parlors operating in the United States (U.S. News & World Report, Nov. 1996). The article ranked tattooing as the sixth-fastest growing retail venture of the 1990s, right behind the Internet, paging services, bagels, computer and cellular phone service. People with any background can own and operate a successful tattoo removal business! Whether you use to work in retail, service, sales, admin, healthcare or any career including a stay at home mom you are qualified to learn this trade! "I knew absolutely nothing about tattoo removal or lasers, my last job was a "mom". The in-depth information I received from Louis and his team was amazing! Their knowledge base and attention to detail really helped get me rolling. I am totally confident with my abilities and love this line of work. I would recommend them as consultants to anyone. The before and after picture on this site is my client and the results are real! The biggest appeal to me of owning my own tattoo removal business was the ability to work the hours of my choice because of my kids. Good luck! -Shelley B. Medical Spa or Just Tattoo Removal Consulting? If you are considering opening a full service medical spa offering laser hair removal, photo facials, Botox, chemical peels and more or, a tattoo removal specialty business--here is some important information. The cost to open up a medical spa is at least three to four times more than the cost to open a tattoo removal specialty business. Since a medical spa involves a much larger operation, ongoing overhead and monthly expenses are also significantly more. In our own business achievements, we have learned that it is difficult to be "all things to all people." Many of the most successful businesses are known for one specific product or service--Subway is known for sub sandwiches, Starbucks for coffee, Supercuts focuses on inexpensive haircuts. Truly successful businesses always find a way to set themselves apart and then they dominate their niche. 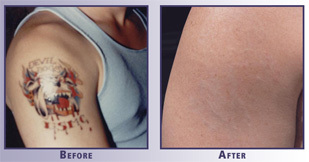 Owning a tattoo removal specialty business allows you to provide your customers with experts in tattoo removal. The best is always the expert, the one who specializes in a particular procedure. The same holds true with doctors; don't we all feel more comfortable with a specialist than a general practitioner? Customers want their tattoos removed by those who do “just tattoo removal". We can help you become a leader in this exploding niche industry. Email us for more information at info@justtattooremoval.com. We utilize the newest, most technologically advanced equipment with superior customer service that provides for safe, comfortable and affordable treatments. You will receive your Laser education at National Laser Institute, North America's leading laser training school. We realize putting you in business is only half the equation while giving you the tools to reach your financial goals is equally important.